High pressure north of the area will provide quieter, comfortable conditions through Thursday. A spike in warmth and humidity will occur Friday ahead of another, much stronger cold front set to move in from the north this weekend. Today and Tonight: Thursday will bring the nicest weather of the week. After some morning clouds, sun will breakout for the afternoon and highs will be close to average in the upper 70s with low humidity. Overnight will be partly cloudy with lows in the low to mid 60s. Up Next: An old front will be stalled in the northern Gulf of Mexico as a new cold front approaches from the north. Warmer, muggier conditions are anticipated Friday as rain chances increase late due to the approach of the front. In some good news for people planning to tailgate or take in LSU’s homecoming festivities on Saturday, forecast guidance has continuously trended drier through the week and so a washout is not expected. The cold front could just bring a quick line of rain through the region. For now, scattered showers will be called for Friday night into Saturday afternoon. However, given the recent trends, a completely dry frontal passage is not out of the question. 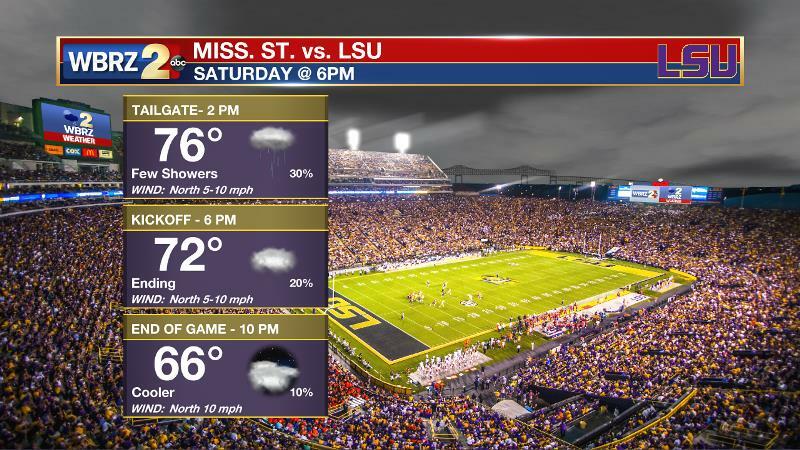 Either way, it appears as though the region will be clearing out just in time for kickoff of the game against Mississippi State. As northerly winds pick up, it could turn quite cool by the end of the game. Meanwhile, in Dallas, the Southern Jags will compete under partly sunny skies with thermometers near 70 degrees. 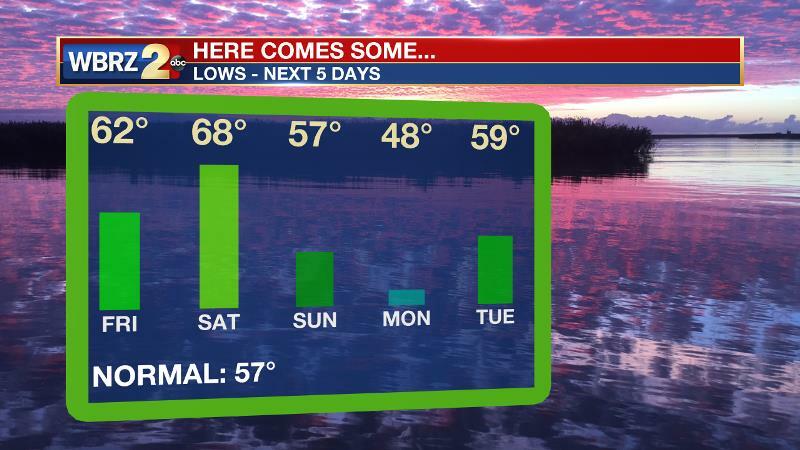 By Sunday, the cold front will push everything south and the coolest air of the season may be here for the new week with Monday morning starting in the 40s. Deep, southwesterly flow will subside as a weak ridge axis aligns with the forecast area. This will allow seasonable, comfortable conditions prior to the next storm system that will move into the area this weekend. A longwave trough will dig into the Southeast from the Great Lakes region on Saturday. This will send a cold front southward toward the Gulf of Mexico. The former front will be stalled in the northern Gulf, perhaps even retreating northward as a warm front. Surface moisture advancing north with this feature may create some overrunning precipitation near the coast while the cold front will tap into this isentropic ascent to create precipitation further north and into the Mid-South as the front crosses. The cold front will push through the region more quickly than its early week predecessor and cooler, drier conditions will be in store Saturday night into early next week. The coolest temperatures of the fall season are expected to follow this boundary with highs and lows almost 10 degrees below average Sunday and Monday.